Mainstream support for Windows 8.1 ended on January 9, 2018. Yesterday's Patch Day marked the end of mainstream support for the two operating systems and the beginning of extended support. Microsoft distinguishes between two support phases for its Windows operating system: mainstream support and extended support. Mainstream support is the first support phase. It includes security updates for supported products but also fixes and other improvements. It is not necessarily the case that Microsoft will release new features for operating systems that are in mainstream support, but the possibility is there. The release of Windows 10 shifted Microsoft's attention solely on the operating system, and that meant that Windows 8.1 did not get some of the feature updates that Microsoft released for Windows 10. A prime example is support for next-generation silicon which Microsoft made Windows 10 exclusive. Extended support is the second support phase and the last, of Windows operating systems. Microsoft will release security updates for operating systems that are in the phase but won't release feature updates or other improvements anymore, usually. The end of extended support marks the end of support for the operating system. Organizations may pay Microsoft for prolonged support but home users don't have that option. Microsoft released security updates for unsupported versions of Windows in the past though, but those were exceptions to the rule. 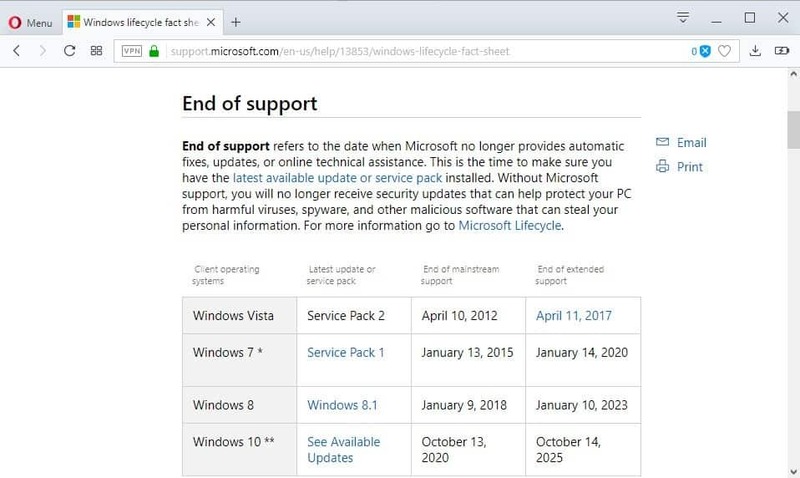 The Windows Lifecycle fact sheet on Microsoft's websites confirms that Windows 8.1 entered extended support on January 9, 2017. Extended support for Windows 8.1 is guaranteed for the coming five years. Support for the operating system ends on January 10, 2023. Mainstream support for Windows 7 ended on January 13, 2015 already. The operating system will be supported with security updates until January 14, 2020. Windows 8.1 users can still upgrade for free to Windows 10. There are plenty of reasons for not upgrading and for upgrading. Windows 8.1 users I talked to mentioned privacy as a motivator for not upgrading and also better tablet support. Users and admins who run PCs with Windows 8.1 won't notice much of a difference. Yes, mainstream support ended and that means no feature updates or major improvements anymore but Windows 8.1 was not really blessed with many of those while the operating system was still in mainstream support anyway. My operating system is windows 7 64 bit ultimate ,and i would like to upgrade to windows 10 but i still reluctant . can you advice me please ? Why do you consider updating to Windows 10? Dont mean to interrupt your therapy seasion Martin but I havnt seen any adds in a few days. In fact it has been hit or miss for a few months. I have uBO disabled. That is strange, I see ad delivery in all browsers I test. Which browser do you use? Maybe something else that may impact delivery (hosts file, other extensions)? Oh, do you see the main toolbar menu or a menu icon? Disabling all addons and removing userContent.css and userChrome.css has no affect, however, restarting in safe mode works. I am using most of the settings in ghacks-user.js on my Firefox 57.0.4. You should put http://www.ghacks.net in “whitelist” – if you want. @Al CiD like I mentioned previously I tried with “all” addons disabled, and ad blocker is disabled in Windscribe anyhow. The first couple days the new theme was up there were ads. Because it is newer and has attractive design but i do not have idea about other features like security , stability, and performance speed . Well there are pros and cons to it. Pro is that you can upgrade for free, and that base Windows 10 is more secure than base Windows 7. You can deal with the privacy issues for the most part by turning them off in various places. You can give it a try, and then go back to the old OS if you don’t like it. I do suggest that you create a backup before you upgrade though. Omar, you should start here if you want to get it for free https://www.microsoft.com/en-us/accessibility/windows10upgrade but do it soon. When does the upgrade offer extension end? The accessibility upgrade offer expires on January 16, 2018. Everyone not using windows 10 yet should do this. If you don’t want it yet, just create a new partition about 40gb and do a fresh install of your OS there and then upgrade that one. Then you can use dual boot to keep on using your current OS while getting your free upgrade for future use. Do not, I repeat, DO NOT downgade to Crapdows 10. I’ve been eager to try Windows 10 since day one and have been using it for a year between August 2015 and August 2016 and while I tried to like it, it was horrible. So many things are broken, so many restrictions, you can’t customize many things you were able to on Windows 7. It’s 2018 and I’m still using Windows 7, Microsoft’s last good version of Windows, after that it is only garbage. Windows 8 was supposed to be a hybrid between a mobile and desktop OS that can change on the go, it was horrible, Windows 10 tried to fix this, but now Microsoft realized Windows Phone is a failure and they will soon scrap it, then Windows 10 will probably evolve again into a desktop-only OS, but that will be too far in the future (probably 2023), also with how bugged Windows 10 is, has been and will be, it shows Microsoft regard even people on the Stable channel as their lab rats, if something doesn’t work, your hardware is the problem, so they won’t fix it, you have to buy a new computer. Microsoft have become scumbags, I advise you to stay with Windows 7 until you reach the point where software/hardware you use drops support for Windows 7 and requires Crapdows 10. I have to disagree there, been using Windows 10 since early 2016 and have been really enjoying it. I have had a few small issues but no more than I’d have on Windows 7 or 8.1. I use apps from the store increasingly and the performance increase alone is worth an upgrade from 7. You can customise almost everything you could on Windows 7, and more. I really enjoy using it, though not everyone’s experience will be the same, and a lot of that is more because Windows has to work on a wider variety of hardware with many different configurations, so not everything will be 100% for everyone. Personally, had they carried on with Windows Phone, I would’ve bought one. It did look really appealing. They haven’t become scumbags, they’re adapting with modern times and trying to look forward to the future. If you want to look at when they were unpleasant, look back at the time of IE5. Sure not everything in Windows 10 is perfect, but there were so many bugs in Windows 7 I can think of. At least 5-10 off the top of my head. Windows 7 is not the perfect OS people make it out to be, and it’s ageing. It doesn’t natively support newer technologies and the design is falling rapidly out of fashion. If you get past the Metro stuff and use Classic Shell, you’d like Windows 8. It’s more stable than Windows 7, and still share A LOT in common with it. Before installing Win 10 on your current PC (as opposed to a brand-new machine), first of all check if your PC & user setup are compatible with Win 10 in terms of specifications, firmware support, driver support, individual applications’ compatibility, etc. For instance, Microsoft & the OEM indicate that my 2010 machine (running Win 7 SP1) is too old to support Win 10, even if I want Win 10 (I don’t). Installing Win 10 on incompatible/ unsupported machines can result in severe breakages. I think a lot of reports about things breaking (eg. black screen/ no graphics, no sound, no network connection, can’t print, touchpad not working, etc.) originate from users installing Win 10 on incompatible machines. Reason being that Win 7 SP1 is generally found on older, end-of-support hardware. Users who upgraded from Win 7 to Win 7 SP1 probably have even older machines. Note: Win 7 SP1 is the oldest OS version that qualify for the free Win 10 upgrade. Machines with only Win 7 do not qualify, unless it is first updated to Win 7 SP1. As such, even if your hardware is currently compatible with Win 10 & nothing important breaks, there is a risk that Microsoft will decide NOT to support your hardware in the next biannual release. Apart from that, I’m pleased that mainstream support has ended because I won’t be bugged anymore to install all the other crap M$ usually sends down the update chute. An OS with great performance ruined by interface. Need I say more? Windows 7 on all my main machines – including my brand new Ryzen build (with wufuc to unblock updates). Well, and Ubuntu LTS on an Intel NUC. Stability is most important to me, and the constant feature updates for Windows 10 (with lengthy install times, risk of breaking existing apps etc) is a no-go. I need to use my PC, not spend time constantly fighting with it over updates and privacy. >>>Stability is most important to me, and the constant feature updates for Windows 10 (with lengthy install times, risk of breaking existing apps etc) is a no-go. I need to use my PC, not spend time constantly fighting with it over updates and privacy. Never hath more sensible words been uttered!!! Windows 8 and I love (only after tweaking though). With Server 2012 updates, I follow the same extended support path that Windows 8.1. One thing Martin, I had heard that the extended support for Server 2012 was extended to October 2023, so I may receive updates a little longer. Came with Windows 7 then “upgraded” to Windows 10. At one point was triple booting 10/Android x86/Linux but now just Linux. Other laptop and tablets were “upgraded” to has Windows 10. To clarify this comment was simply saying have not a clue what I will do. Win 10 Pro (one laptop, one desktop), Win 10 Home (4 laptops). Pro, IMHO, is the only way to go for Win 10 because of the gp editor. Pro behaves completely differently than Home, which reminds me of a little dog constantly nipping at your ankles. RIP Win 8. One good thing about it was it spawned a huge amount of software to make it behave more like users (customers, microsoft!) wanted. Worstest thing about it, beside its flakiness, was that mobile/desktop/laptop “modern (wtf?) interface” that plagues Win 10. Why do I need to see a giant gear? Why not a pink bunny? LOL! Seems like preteens designed these interfaces. > Pro, IMHO, is the only way to go for Win 10 because of the gp editor. Interesting. Running Win7 but if I ever switch to Win10 I’ll remember your comment. >[Win8] Why do I need to see a giant gear? Why not a pink bunny? LOL! I’d prefer the pink bunny, LOL! Using Win 8.1 again after trying Win10. Running it with Classic Shell and that’s all it needed to be a great performer. Windows 10 just didn’t feel right, I don’t want and don’t need Cortana. Plus, would you believe it, my Win 8.1 runs faster than W10 and without problems. Keeping it, but don’t know which way to go after support will stop completely. Don’t care for Linux after trying it. Yea, I’m sticking with 8.1 too. Get five more years until security support patches ends so no worries for now. How was Windows 8 flaky? It was in fact one of THE MOST STABLE Windows releases, in fact better than 7. Running it VERY happily. Why are many still not clear about Microsoft [post Win 7 mainstream support era]? All they need is ditching older OS with botched and spyware updates, creating new issues with previous updates, pushing and confusing good fans and stable users and more. Why we need a new UI with every Windows Release post stable XP/Win 7? Any good CEO will agree with SSP – Stability, Security and Privacy. Since they are more important than nasty spyware/annoying features like in Win 10 or Win 8/8.1(UI and dual configuration tools). The Microsoft CEO’s and employees lack this very much. I heard people say Win 7/8/8.1 is bad/worse than Win 10. They need a flashback of MS history. Most problems we had/have in XP/Win 7/8.1 are caused by Microsoft patching and not by the OS itself. Currently, there is a huge need for an OS with above SSP priority and ability to match all Windows XP/Vista/7/8.1 features and UI without much trouble on future migration. Also, the same tools need to be released as standalone for Windows versions to help enable migration in future. In parallel, the OS should have the compatibility with EXE/MSI/other application formats. This would help 3rd party s/w to be added with ease and devs would have less work in adding support for the OS. All this should be done within Win 7/8.1 extended support is over. If we delay, then we’d end up similar to Firefox Australis 52.x->Quantum Photon 57 on legacy add-ons. People are struggling for alternate to 32-bit Firefox 52.x ESR since WaterFox supports only 64-bit and their plan for a new browser would probably be missing x86. We have Palemoon but configuring is like installing XP/Vista/7/8/1 on 2018 by paranoid/security/privacy user. We have Linux but all they need to add in 2018 is .EXE/MSI compatibility and support for Windows s/w only since they have SSP in place. Win 10 users need to think, if MS frequently change features and support, how can we have stability with apps and the OS itself? We’ll be dammed one day! @Martin, if you’d consider the above, please do research, post an article, suggest an OS, browser alternate for Win 7/8.1 and Firefox x86/x64 users respectively ASAP. and has multiple ways of Scooping up user Data. The telemetry is far to intrusive, and aggressive. Anyone still on DOS 3.01 complaining about Windows? I dislike Microsoft for many reasons but I will give them credit for providing support to their various OSes. Looking over Windows 7, for example, I see 10 years of support. I remember IBM’s consumer OSes getting the same professional & serious treatment re: support. IBM even did a final PC-DOS update, long after DOS was gone, just to fix the y2k bug. In contrast, it took Canonical a while to provide their Desktop users 5 years of support (from the previous skimpy 3). I say this as a Linux user myself. The best bet here are stable rolling distros. Apple is secretive, as always – I got tired of searching for an answer for this pretentious company. At least they have a rolling release model. Android is a complete joke while ChromeOS is a little better at (around) 5 years for their *simple* setup. I really dislike Microsoft but they are the Kings of Support for Desktop users. My wife’s computer has 8.1 on it and so does my son’s (I use Linux Mint). I didn’t even know that mainstream support was over until I saw this article. I imagine that I won’t notice any difference anyway. I’ve been trying to talk them into running Mint to make my life a bit easier (I’m the house IT guy). W8.1 is only almost dead – no need to give it the RIP treatment, yet. I have W7 on my main system . An OS for grownups. One family member has warmed to W10. He does not care about privacy, knows nothing about security and likes the Fisher Price look and feel. Also have had Ubuntu for years on older laptops. I’m on 8.1 and happy with it. One of the reasons I stick with it is the privacy thing. I’m used to it. Not really wanting a new learning curve. When 8.1 expires though I will not use MS anymore and will switch to Linux or whatever open source OS there are. That’s similar to what I figure, but at this rate, I don’t need to worry until 2023. I figure at that point for day to day business, I’ll run Q4OS or FatDog64, or something like that. That takes care of productivity, web browsing and email. Then I’ll install XP on to an old retired PC box, unconnected to the Internet, and use it as an audio workstation. However, everything could change in a HUGE way in 2023. Huh? I keep hearing that Windows has such long support cycles, but 8.1 didn’t have such a long support cycle, apparently. 5 years isn’t really all that long, compared to, say, XP or 7’s support cycles. So I guess it’s not true in all cases. Windows 8 was released in October 2012, but Windows 8.1 was released in the same fashion that a service pack would be (although it really is a separate OS). So altogether that’s also just over 5 years of mainstream support. And with extended support ending in January 2023, that 5 years of extended support for Windows 8.1. However, if you’re adventurous and want to be able to get updates until October 2023, use Server 2012 R2 updates for an additional nine months, on Windows 8.1. I plan to do the same on Windows 8 RTM, using updates from the original build of Server 2012. And how would you go about getting that set up? Well @scorpiogreen, I’m on Windows 8 RTM. Every month, I’ve made visits to Microsoft’s Update Catalog, and downloaded the correct updates for .NET, Security-Only, Flash and IE10. Then I install them one by one. This MSFN thread will be your friend. I can only assume that once Windows 8.1 support expired, you’ll be able to do the same with Server 2012 R2 updates. There will only be a nine month gap anyway. @JodyThorton, I’m a little confused. So once Extended Support for 8.1 ends on January 2023, I can then use Server 2012 R2 updates for 8.1 beyond then to October 2023? And what criteria would I need to do that? I have standard 64bit 8.1 Professional. What you’d do is download the updates manually each month from the Microsoft Update Catalog, starting in February 2023, and keep doing that for the next nine months. So youu’d look for the x64 Security Only update for Windows Server 2012 R2. Also you’d download any .NET updates and IE 11 updates. …and work from there. I didn’t know they would be good after January, 2023. Here on Xp and all is good…. Still on XP x64 and 7 Ultimate x64. Won’t upgrade to Microsoft’s later spyware editions; 8.1 and 10. Careful @Stefan. Windows 7 (especially with telemetry in updates) is no less prone to data gathering than Windows 8x (actually the original Windows 8 might be a tad superlative in this area). But you have to stop calling it “spying” or “spyware”. It’s more like information gathering targeted or niche advertising. I don’t like it either, but traditional media has become less suitable for advertisers, so targeting social media and websites is it. I run windows 8.1 sp3? only for gaming and have no interest what so ever to use things like classic shell right clicking to start button take me to where ever i want to go and some icon in the task bar. If not their is always run or search. If you are happy using windows version ? , Linux , Mac That all you need…..
It’s been 8.1 and Classic Shell since 2012 and before that XP 64 bit. I might migrate to Windows 7 just to install a Longhorn theme or two but after that it’s eventually going to be over for me and Windows unless Microsoft changes course drastically. The blatant disregard for customers, refusing to support new CPUs on 7 and 8.1 for example; but never mind rehashing all the outrages. I’ll eventually learn to install some slightly esoteric stuff in Manjaro or Mint and then it won’t matter anyway. Being a power user on Linux is much harder when lacking serious software knowledge, which I unfortunately do. Just about to become new Windows 8.1 user – a rare creature I bet. My main rig’s Windows 7 install is quite long in the tooth, being from 2011, and I was recently contemplating its future. Security updates end in two years. The system’s mobo is quite old, and if it’s not lack of performance or features that’ll get me, hardware failure might. Having experienced Windows 10 on my laptop, I knew there was no way I’d be extending that relationship to my main rig, while moving to Linux with 25 years of Windows baggage is something I’m in no hurry to do even though I’ll have to bite the bullet eventually. That got me thinking about Windows 8.1, with its security updates to 2023. Since the 200-series chipsets and Skylake CPUs are the last to be supported with 7/8.1, it seemed the last chance to make a move hardware-wise if I wanted my choice of motherboards (old CPUs are easy to get, but availability of previous-gen mobos quickly dwindles to overpriced scraps, at least here in Australia), and if I’m doing a major hardware upgrade I may as well do the OS at the same time. So I recently picked up a 6700K, ASUS Z270G, Windows 8.1 and Classic Shell. After some frustration ironing out a couple of interface peeves, on top of the expected hour after hour of installations and configuring, I couldn’t be happier with the result, and I’m expecting to switch over from my old rig shortly. What all did you have to sort out? Was it all fixed with Classic Shell? Just some small things I’m really fussy about – one was getting the taskbar to properly ‘hide labels, never combine’ as I’d had it set in Windows 7, another was disabling the lock screen, and another was removing the “Folders” from File Explorer. But the one that really had me banging my head against the wall was pinning File Explorer to the taskbar and have it open D:\Download, without having to right click it and select from a menu, and without it spawning a separate taskbar icon. Took ages searching and trying fixes that didn’t work, before finally stumbling upon one that did. Don’t think any of those had much to do with Classic Shell – they’re moreso interface hacks I was trying to carry over from Windows 7, which required a different method to enable on 8.1. I feel lucky to have managed to find ones to address my particular peeves, as it may not be the case for everyone else. Classic Shell did its job bringing back the start menu and has heaps of options for customisation. My only complaint is that it doesn’t look identical to the Windows 7 one (don’t have time to boot up the 8.1 rig just now to confirm what’s different, but I think it was mainly due to differences in font/spacing). I am not a fan of Windows 10 far to many apps and far to much junk and proccesses running in the background If you are a Fan of the Old windows & which I was then Do the above Buying the Key for a couple of quid means if you dont like it or fancy trying Win 10 then you have an original digital key for 10 you cannot lose out Hope you enjoy this read It works & Its all Good You get the best of both Worlds Its a Lot Cheaper than you think and Just as Fast & Fun as Old Windows 7 Do it your own way no apps and no adverts a clean fast pc thats fun music movies and youtube all you need the rest is garbage Fight for a light Windows It is possible win 8.1 pro and you will thank me Later Time is not running out you have all the time in the world . Last week, I had the choice to reinstall Win 7 or to upgrade. Just bought Win 8.1 pro. So far so good. In 2023, will have to see what’s available.